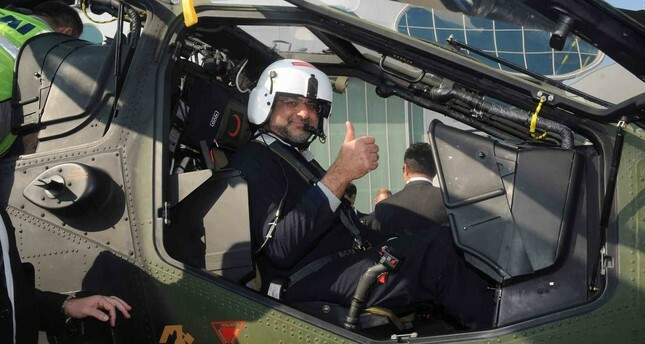 Pakistani Prime Minister Shahid Khaqan Abbasi previously tested a T129 ATAK helicopter and appreciated its impressive qualities. Turkey and Pakistan are on the verge of inking a deal for the purchase of T129 Advanced Attack and Tactical Reconnaissance Helicopters (ATAK). According to defense sources in Ankara, who spoke to Daily Sabah on the condition of anonymity, the Turkish and Pakistani governments are close to closing the ATAK helicopter deal in the upcoming months, if not weeks. The sources underlined that the ATAK helicopters were tested and the Pakistani side has expressed their contentment with the helicopters in line with their needs and requirements. In fact, Pakistani Prime Minister Shahid Khaqan Abbasi, who visited Turkey last year in October, examined the T129 ATAK helicopter during a test flight. Calling it a "very impressive helicopter," Abbasi said at the time that contract talks were continuing at full speed, expressing Pakistan's desire to acquire the helicopter and add it to the Pakistan Army forces as soon as possible. Meanwhile, three ATAK helicopters have recently been sent to Pakistan to partake in a celebratory parade. The helicopters will take off on the National Day. On the other hand, diplomatic sources said that the helicopters were sent to Pakistan on the occasion of the country's National Day as a sign of solidarity with the brotherly people of Pakistan. Recent reports in the Turkish media contended that the deal between Turkey and Pakistan for the purchase of the helicopters will be around $1.5 billion. However, there has not been a confirmation either from the defense or diplomatic sources in this regard. Despite the positive messages from both sides, there may be a couple hindrances in the way. First, a green light was needed by the American engine company for the purchase of the ATAK helicopters. Turan Oğuz, a defense industry expert, said that an approval has been given by the Americans. He pointed out that the U.S. has already been selling helicopters to Pakistan, which, according to him, would make the transaction easier. Another obstacle in the way of the purchase was the credit that Pakistan demanded from Turkey to make it work. Oğuz said that an approval is awaited from a Turkish bank. The T129 ATAK helicopter is a new generation, tandem, two-seat, twin-engine helicopter specifically designed for attack and reconnaissance. ATAK helicopters have so far recorded over 12,000 flight hours, and the aim is to develop a homegrown engine and a domestically produced 20mm artillery system. Developed from the combat-proven AgustaWestland A129CBT, the new aircraft incorporates a new system philosophy with a new engine - LHTEC CTS 800-4A - new avionics, sight systems and weapons, modified airframe, updated drive train and new tail rotor. According to Turkish Aerospace Industries (TAI), which produces the helicopters, a total of 91 T129 ATAK Helicopters will be delivered to Turkish Armed Forces and 9 T129 ATAK Helicopters will be delivered to Ministry of Interior. The ATAK helicopters were also used in the recent Operation Olive Branch and received appreciation from the experts. Oğuz believes that exporting 30 ATAK helicopters to Pakistan would be a tremendous morale boost to the Turkish defense industry. "There is expectation piling on the defense industry. It would be a great psychological power helping the industry move forward. It would also be a psychological power in terms of the purchase sum," he said. In terms of Turkish-Pakistani military relations, the defense industry expert contended that selling such platform exports would mean a military cooperation for the next 40-50 years. Cooperation with the Pakistani military has been playing an important role in Turkey's activities abroad. A total of 1,494 Pakistani military personnel received their military education in Turkey since a bilateral agreement was signed in March 2001. Out of the total, 116 Pakistani military personnel were sent to the Turkish Armed Forces Partnership for Peace Training Center while 138 others received their education at the Center of Excellence and Defense Against Terrorism institution in Ankara.